Canoeists in KwaZulu-Natal are relishing the start of the summer season that leads to the FNB Dusi Canoe Marathon in mid-February, as the end of the four year drought leaves them with very good water levels in the uMsindusi and uMngeni catchments. Since the spring start of the river paddling season, regular paddlers taking part in the races on the Upper uMngeni below Albert Falls dam have been relishing paddling on superb water levels, and the man behind managing that water says the reason is twofold. Kevin Trodd, the KZN Canoe Union Water Liaison Officer says the overall dam levels are dramatically better at this time of year than they have been at the corresponding time in the past four years. Trodd said that the relationship with the Umgeni Water authorities who manage the flow of water between the major dams servicing Pietermaritzburg and Durban has also never been better. “We have a great working relationship with Victor Hlope and the whole team at Umgeni Water. They have a delicate balancing act to perform moving water from one dam to another to best service their consumers. “The key dam is Nagle Dam, so there needs to be a reliable flow of water from Albert Falls dam to Nagle dam. That’s the main gravity supply dam for Durban and ideally that needs to stay at between 60 and 70 percent full. “What has really made us excited as recreational users of the Upper uMngeni between Albert Falls and Nagle dams is the understanding that water can be throttled back during the week, and the flow increased on the weekends to allow paddlers to utilise the river at a safe and enjoyable level, without compromising the water supply to Nagle dam in any way at all. “It has been exciting to see the uMngeni Water team taking a holistic and far-sighted view on the management of the water, and the fruits of that are obvious to see. It has had a huge effect on canoeing, and every weekend, whether there is a race or just canoeing tripping or training, there has been a big increase in activity on the river. “It has also been excellent for the environmental condition of the uMngeni valley on that stretch, so it is ticking a lot of boxes,” he said. Trodd said that the upcoming Ozzie Gladwin Canoe Marathon was one of the biggest on the local calendar, and paddlers could look forward to superb water levels for that race. “We have had a terrific level of about eight to ten cumecs (cubic metres per second) for the last few races on the Upper uMngeni, which has been really well received by the paddling community. 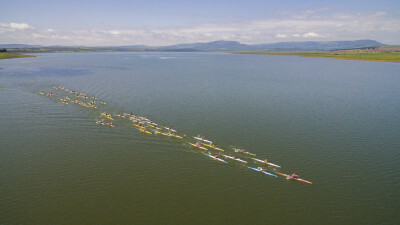 I will be putting in a request for ten to eleven cumecs for the Ozzie Gladwin, which should make it a really memorable landmark event on this stretch of water,” he said. Trodd added that the spin-off could be expected to continue for the rest of the Dusi season, where Henley dam above Pietermaritzburg and Inanda dam outside Durban were also central to their planning. The 2018 Ozzie Gladwin Canoe Marathon takes place from Albert Falls Dam to Thornvale Farm on Sunday 25 November.